The story is cleverly put together as Satan continuously finds loopholes in Stanley’s wishes and repeatedly plops him into alternate realities that undermine everything he expected – but what stands out to me more and more with my repeated viewings of this one over the years is how sharp & successful the subtlety of the humor is. The dialogue, overloaded with genuine wit, flows along with a style of cleverness that is never self-conscious (unlike far too much of today’s too-smug-for-the-room humor, unfortunately ubiquitous on TV and in film). Donen’s direction, slick as always, keeps things moving along and paced well. And every time I see this movie, I pick up on some other subtle pun, double-entendre, or Britslangism that I somehow either missed or forgot about. 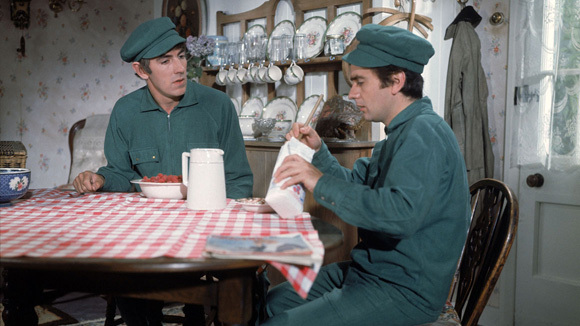 Before Dudley Moore immersed himself in Hollywood’s repeated post-Arthur attempts to cast him as a cutie pie, and before Cook’s excessive drinking slowed his comic wheels, these two guys were really at their peak about this time. They work some of their earlier sketch material into Bedazzled (notably the trampoline-jumping nuns) but most of this relies on their comic interplay and frequently brilliant satiric commentaries on the nature of sin, evil and morality. For more of their earlier material, the best of their sketch material that survived the BBC’s videotape recycling policies (the same policies that very nearly destroyed the entirety of Monty Python’s Flying Circus) can be found in The Best Of/What’s Left Of Not Only…But Also, which contains a “Thunderbirds” parody that’s just out-and-out brilliant. Yet another movie that endured a totally unnecessary remake…. see the ORIGINAL Bedazzled.